Essence International School is located in a quiet corner of Kashim Ibrahim Road, in Kaduna, a beautiful and dynamic city in Northern Nigeria. We are a four-tier institution offering quality instruction in an educationally stimulating atmosphere for students in pre-nursery, nursery, primary, and secondary. Founded in 1982, Essence began as a nursery school and expanded over the years to include all grades up to the final year of secondary school. Our Nursery is made up of 4 classes – Toddlers, Pre-Nursery, Nursery 1 and Nursery 2. Our Nursery kids are involved in many activities including reading story books, movie sessions, LEGO games, building blocks, bird watching, bicycle rides, art and crafts, swimming, singing Nursery rhymes, and playing outdoors with “Tweety” and other play sets on the 3 Nursery campus grounds. Students have a strong academic learning environment with small classes, attentive and dedicated teachers, as well as nannies to help with lunch and bathroom breaks. 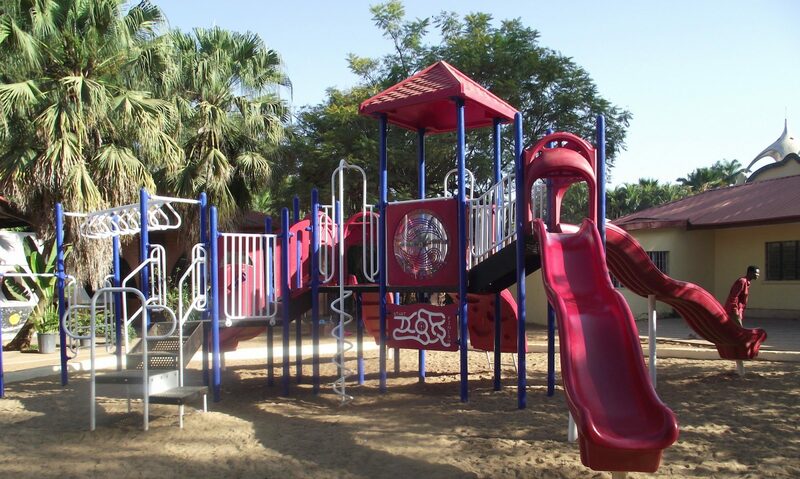 The AHV encompasses both our Nursery and Primary Sections. Primary begins with Primary 1 and ends with Primary 6. The curriculum is based on both Nigerian and US standards and includes a strong focus on African history, languages and current events. Students cover 16 subjects in a week and have several competitions to showcase their academic performance such as the annual Spelling Bee, Math Bee and Geography Bee activities. Essence Secondary has opportunities for all students to learn, grow and excel in the sciences and the arts. For Senior Secondary students, there are two major paths: Arts & Sciences or Pure Sciences. Both offer rich options for students to develop their knowledge and skills in many areas such as Biology, Fine Art, Chemistry, Physics, Technical Drawing, Languages and Data Processing. Many sporting activities are also available for the students including football, basketball, swimming, polo and bicycle riding. The Open Classroom is the Non-governmental Organization (NGO) of Essence International School, Kaduna. We registered as an NGO or non-profit organization with the Corporate Affairs Commission (CAC) in 2005. Our operational base has been Kaduna, but our members have worked in many areas of the world on our behalf in the USA, Brazil, Kenya, Niger Republic and Swaziland. Our goal is to provide an educational outreach to children in poor and disadvantaged areas. We have a team of dedicated professionals in the field of primary and secondary education with many years of activism and community service. Our organization is the platform by which we focus all of our financial and human capital to accomplish our objectives in the field of education. We have several programs and ongoing projects that have transformed the educational opportunities of thousands of children in Kaduna and at all our project sites.